There’s always a first time for everything—some just come later than others. When opened in early December at a cost of $42 million, The Wolfe Center for the Arts replaced outdated facilities in 97-year-old University Hall, marking the first time in the 102-year history of Bowling Green State University that theater facilities were built from scratch. 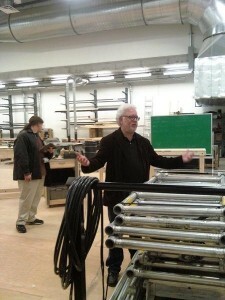 Ron Shields, chair of the Department of Theatre and Film, shows students around the new Wolfe Center for the Arts. Photo by Nate Lowe. Complete with the latest technological advances, the building’s two state-of-the-art theaters, the larger Donnell Theatre and the 120-seat Eva Marie Saint Theatre, replace old, makeshift facilities that were not originally designed for theatrical purposes. For more than 50 years, major productions on campus were staged at the Joe E. Brown Theatre, which prior to 1960 served as a gym in the basement of University Hall. The old Eva Marie Saint Theatre, which is also located in University Hall, originally served as an auditorium before being renovated and turned into a theater. Dachik, who has spent 13 years at BGSU, the last two in his current position, said both theaters lacked climate control and were barely compliant with the Americans with Disabilities Act. Because of this, well-known business owners in town lost interest in campus productions and ticket sales plummeted, he said. Housing numerous offices and classrooms, in addition to its two theaters, the new home of the Department of Theatre and Film offers students an environment conducive to creativity and learning—a necessity Dachik said didn’t exist in the old building. Upon entering the main lobby on the first floor of the glass-fronted Wolfe Center, visitors are greeted by a box office to their left and a grand staircase on their right. A large mural, rising 30 feet high and stretching 86 feet in length, lines the east wall. Along a corridor behind the 400-seat Donnell Theatre is a costume shop and dressing rooms. A set design workshop provides stage crews with ample space to construct sets. 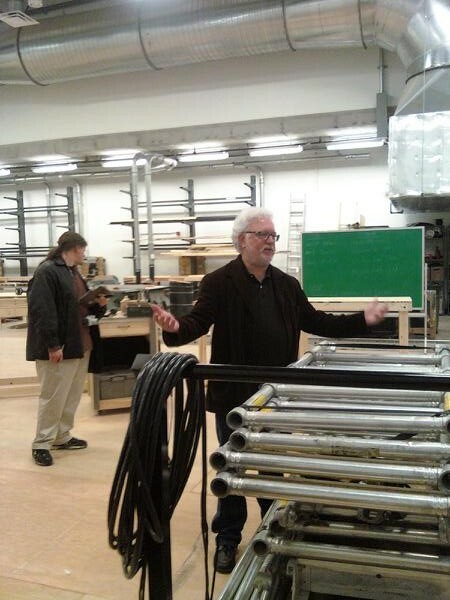 Ron Shields, professor and chair of the Department of Theatre and Film, said the new 800-square-foot workshop is convenient for students, who had to construct sets on stage in cramped University Hall. 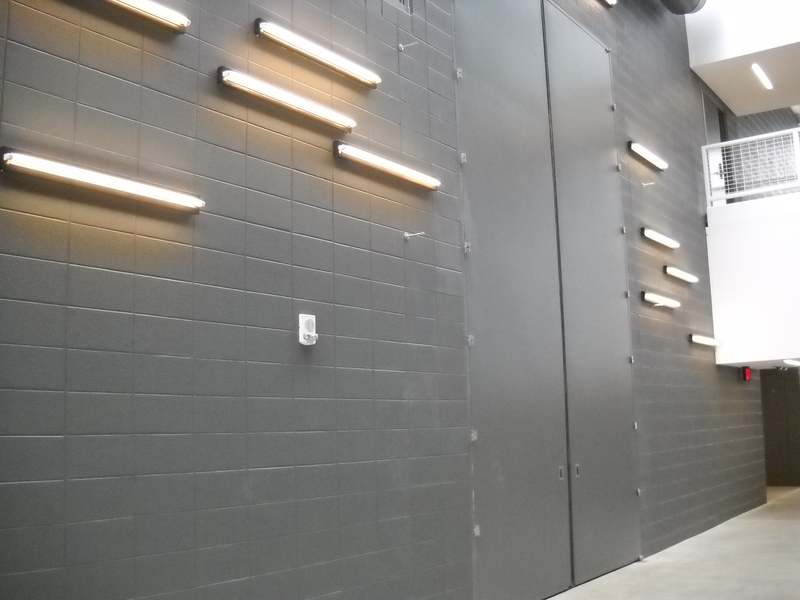 Crews can easily move materials from the workshop into the Donnell Theatre through 20-foot-high doors—just one of many improvements that teachers hope will attract more students to theater programs at BGSU. Stage crews can easily move materials from an 800-square-foot workshop into the Donnell Theatre through 20-foot-high doors. Photo by Nate Lowe. In fact, Shields said he remembered arriving on campus more than 20 years ago and being told that a new building would soon be constructed. “I was told in 1986, ‘Don’t unpack your boxes because we’re going to move into a new building.’ That was 26 years ago,” Shields said. University officials originally planned to construct a much larger facility. Recent cutbacks in state funding, Magelssen said, forced the department to improvise. Shields, referring to the current economic state, said the university deserves enormous credit for securing funds to build the 93,000-square-foot structure. This entry was posted on Tuesday, January 31st, 2012 at 9:04 pm	and is filed under BGSU, Spring 2012, Wolfe Center. You can follow any responses to this entry through the RSS 2.0 feed. Both comments and pings are currently closed.